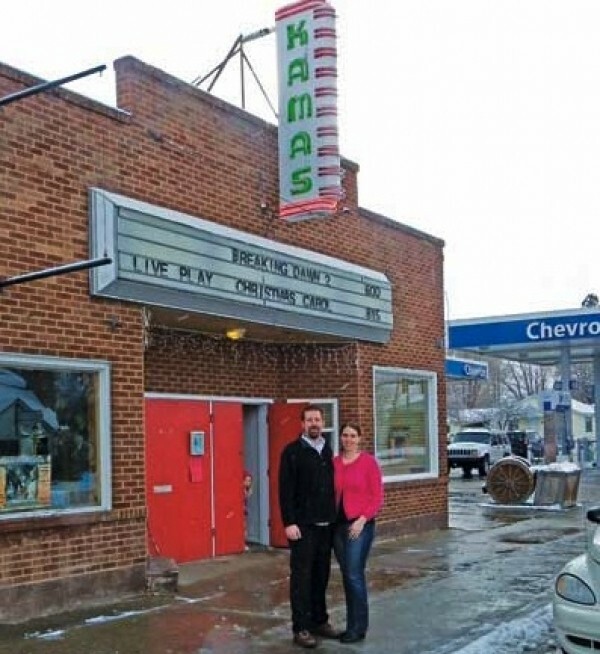 Kevin and Sharee Harris are co-owners of the Kamas Theater, a small movie theater built in rural Summit County in 1942. The couple took over theater operations in 2011 and made many upgrades to the theater, such as installing new seats and a heated floor. The Harrises are now working to save the historic 1940s theater from closing by raising funds for a necessary digital upgrade. So far, they’ve raised about $5,000 of the needed $65,000. People can donate any amount at Kamas-Theater.com or donate $25 to $100 to get a personalized nameplate on one of the theater seats. Why did you decide to operate a small-town movie theater? Kevin Harris: My degree is in film multimedia. We had been talking about doing community classes. We were in Denver at the time, and we heard about this place from my father-in-law. We learned there were spaces on the side where you could do community classes. And there was a theater. I thought it was the best of both worlds. What is the appeal of running an old-fashioned theater like this one? Kevin: It’s just fun to be able to bring people in out of their normal world and into a film world. … Sometimes you have dead audiences. Sometimes you hear lots of laughter in there. It’s exciting for me to hear people enjoy themselves. How does the experience here differ from an urban theater with multiple screens? Sharee Harris: It’s pretty personal. We know a lot of the people that come each week. Every Wednesday night, certain people are going to come, and every Thursday night, a specific group will pop in. It’s really been quite personal getting to know them. Were you aware of the theater’s history when you started running it? Kevin: No, not really. I’ve done a lot of research on it since then. People have e-mailed me pictures and told me stories. I didn’t know much at the time. I found out the opera house was a different building a block down the street, where the library is now. That burned down, so they built this one to replace that in the 1940s. Why are the digital upgrades necessary? Kevin: On Jan. 1, Disney is leading the way and going completely digital. They won’t be making any more prints. And by the end of 2013, all the studios are supposedly going to be digital. So by the end of 2013, we will not be able to get any new releases. We can go back and show old stuff, but we’re not going to get any new films. To get one projector—not 3-D or anything fancy … the cheapest quote we’ve gotten is $65,000. Why did you decide to make nameplates part of the fundraising effort? Do you have other plans in the works for the theater? Sharee: A combination of movies and doing plays on the stage down in front of the screen. We’ve started doing some plays, and it’s great to bring individuals from the community to watch. The children have joined in. We don’t have the big drops being moved—it’s the screen that changes the background. It’s really cool. Right now with A Christmas Carol, we have the ghosts up on the screen and the actors are talking to the ghost on the screen. It’s very interactive. Kevin: We want to do more than just film. We’re trying to do art classes and live theater. We want to be an arts center, not just a movie house. Our vision is to upgrade a bit and keep things going. Make this more of the hub that it used to be.